GALT, CALIF. — A dog spotted periodically by motorists in the median of Highway 99 in Galt over more than three weeks has been rescued. Galt Police Chief Tod Sockman said drivers had reported seeing a German shepherd loose in the median in the C Street and Simmerhorn Road areas for five weeks, starting April 10. But when officers responded, they were unable to locate the animal. After Galt police received yet another call, they headed back out to the freeway around 8 a.m., Sockman said. The California Highway Patrol stopped southbound traffic on Highway 99, allowing police Officer Sylvia Coelho to catch the dog. 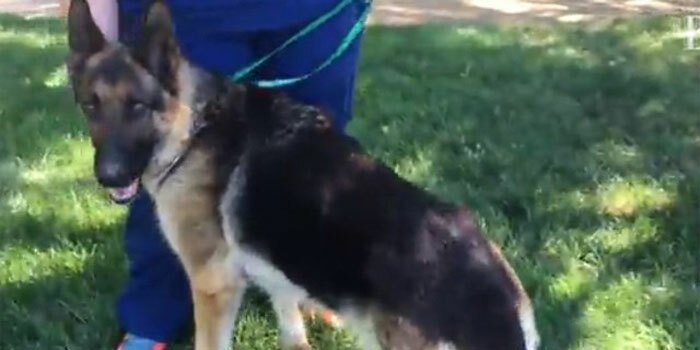 The dog, a female, was taken to VCA Bradshaw Animal Hospital in Elk Grove with a broken leg. She was also suffering from malnutrition and dehydration. Sockman said veterinarians determined the broken leg was an old fracture, so the dog probably had been staying in the median during the period that the sightings occurred. He said it is not known how she managed to survive. He said Coelho on Monday visited the dog, dubbed “Freeway Frida,” and she appeared to be doing well. The dog had no name tag or license that would help identify her owner, Sockman said.